Join us for the last tour of the season charting the rise of modern Rome and its early 20th-century expansion by visiting the Quartiere Coppedè and its surroundings. The enchanting fairy-tale atmosphere of this little-known neighbourhood, adjacent to the Viale Regina Margherita and not far from Via Nomentana, is also echoed in Prince Giovanni Torlonia's folly house, which is nestled among the trees of Villa Torlonia and which acquired its present name (Casina delle Civette, or House of the Owls) in 1906. 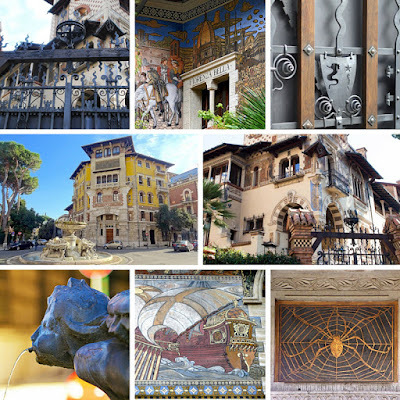 Today one of Rome's art museums, it houses one of the city's best collections of art nouveau stained glass. Time: 9:45 a.m. sharp departure, 9:30 for coffee beforehand. Cost: €10 for members and €15 for non-members, plus €6 museum admission. RSVP required by Thu. May 26th, ATTN Joe at canadarome@gmail.com. You are financially responsible for your reservation.